The Initial Examination of the Fracture Site with View of this Species Uniquely Positioned Maxillary Tusk. What’s left of the Sub-Gingivally Fractured Mandibular Tusk. Removing the Hyper-plastic Gingival Tissue to Find the Remaining Tooth Structure. View of Secondary Dentine Bridge Protecting Underlying Vital Pulp Tissue. The Process of Sealing, Protecting and Bonding to the Remaining Etched Dentin. It Sometimes Requires a Bulk of material to Restore a Large Tooth. The Restored Tooth is X-rayed to Document the Case for the Patient’s Medical Record. 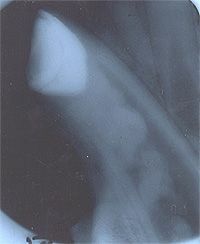 Radiograph clearly Demonstrates Restoration, Secondary Dentin Bridge, Developing Pulp Stones, and Vital Pulp Tissue.